Dropping your fifth wheel is more common - and dangerous - than you might think. Just ask some of your RV friends that have experienced it. You can put that worry to rest with the Bedsaver. 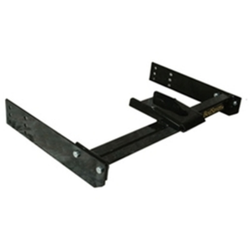 This inexpensive, hassle-free safety device is a "must have" for every fifth wheel puller. With BedsaverTM, you can forget about dropping your fifth wheel - and forget about the potential danger, damage, expense, and embarrassment! 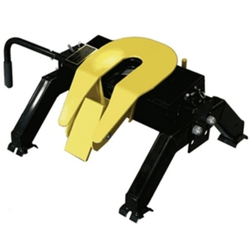 The Bedsaver is a sound investment with great returns for all fifth wheel pullers. Pin LockTM adds an extra measure of safety to your fifth wheel. This simple device utilizes a counterweight door that folds down when you're loading the flips up to lock the pin in place. This prevents the pin from accidentaly disengaging. The only way to remove the pin is to raise it over the pin lock. Pin LockTM is easy to install. Simply remove the front and back bolts that secure the top plate and replace the top plate with the Pin LockTM.